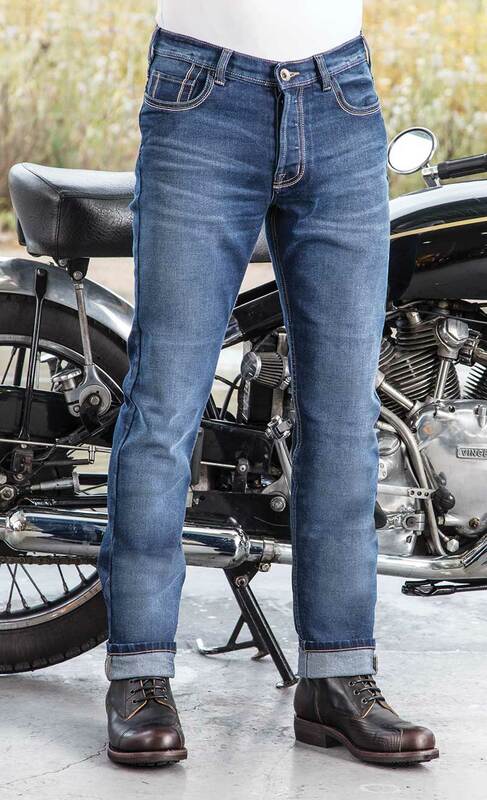 There’s no more dynamic and exciting category in motorcycle apparel than riding jeans. They’ve come a long way in the last five years. The technology is making them ever stronger and lighter, whilst the dictates of fashion are making more them ever more stylish to wear. Traditionally, most riding jeans have been Kevlar or aramid lined. So the outer material was usually a standard denim, sometimes with a bit of stretch thrown in for comfort. Inside, the jeans were backed with an abrasion resistant fabric of some description. These jeans worked, but those that were 100% lined were often uncomfortable to wear, especially in the summer. Those that were partially lined sometimes had only a tiny amount of protective layering, meaning that, in some cases, they were next to useless. There is, of course, another category of motorcycle jean that actually has no protection at all, other than protectors in the knees. 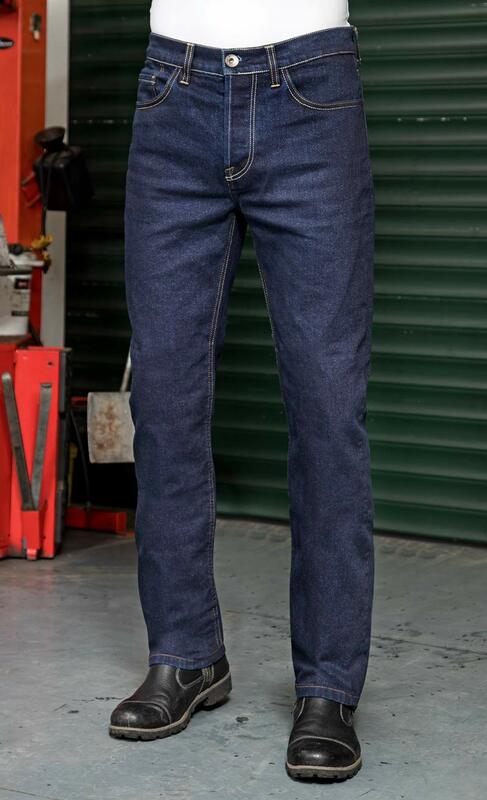 Some of these denim jeans look very credible, and although we have met owners who think they have bought something rather special, these pants offer absolutely nothing by way of abrasion resistance. In fact, if you come off the bike, a standard denim material will normally burst on impact, immediately exposing the skin to the road. Frankly, this style of jeans is to be avoided at all costs, unless all you want is to look like a motorcyclist. But in the last few years there has been a move towards what are known as single-layer riding jeans. Instead of having an abrasion resistant lining behind the denim outer, these jeans achieve their strength by weaving a super-strong thread in with the cotton. That’s a slightly simplistic explanation; the actual technology and weaving techniques are much more sophisticated, but the principle remains. Single-layer jeans are very much the future, and we predict that in a few years’ time motorcyclists will laugh at the concept of lined jeans in the way that, these days, we mock cassette players and floppy discs. Single layer jeans are simply nicer to wear. They are not, it has to be admitted, as warm as lined jeans, which are nicer in the winter. But lined jeans are pretty horrid to wear in the summer; especially the higher-performing, fully lined jeans. Single-layer jeans are often no heavier than a jean you might buy from Levi’s or Gap. In the summer, they’ll flow the air nicely to keep you cool. If it’s cold, you might want to wear a legging of some sort, but with a single-layer trouser you at least have the choice. With a lined jean you don’t. It’s always lined; the lining cannot be removed when the temperature goes up, so you’ll always boil when it gets hot. The other key benefit of a single-layer jean, in our book, is that the protection is everywhere. Now, as we will explain, some single-layer jeans are stronger than others, but with all of them you can take comfort from the fact that you will enjoy the same level of abrasion resistance everywhere. From the waist and bum, to the hips, to the shins, to the calfs, to the ankles. But that isn’t the case with most Kevlar-style jean. Some have 60% coverage; that’s the good ones. Others have 40%, 20% or even less. Shops and websites will often not be clear on this; sometimes because they don’t know, sometimes because they want to imply that their jeans are more protective than they actually are. Swiss company, Rokker, it is widely acknowledged, are at the forefront when it comes to the development of the single-layer jean. Their waterproof Revolution jeans and their City Chinos are both phenomenal bits of kit. In their market sector, they are both the benchmark products. But these are stories for another day. In this review we want to tell you about their amazing Rokkertech jeans. The Rokker Rokkertech Straight-Slim single-layer riding jean. The Rokkertechs are not waterproof. They look, feel and wear like a good quality pair of denim jeans. By good quality, we’re talking about the jeans we all used to buy 20 or 30 years ago. We mean work jeans that you could wear day-in-day-out for years on end. Most modern jeans you find on the high street are about as robust as a pair of leggings. That’s not the case with a pair of Rokkertechs. They’re still light, they fold easily and are incredibly comfortable. But they feel rugged, and as though they can take a lot of punishment which, of course, they can. The material used by Rokker in the Rokkertechs is known elsewhere as Armalith. Armalith is hugely strong; on the internet there’s a video of a Hummer vehicle being lifted up by a pair of Armalith jeans. Not sure how relevant that is, and how other jeans would fare. But we were certainly impressed. Now the Rokker Rokkertech jeans have been around for a while, but it was only in January of 2018 that Rokker took the jeans to the SATRA test facility to have them tested on the Cambridge machine. This is the test used for the current CE standard, and it involves lowering a swatch of material on to a revolving sanding belt. The abrasion resistance of a fabric is measured by how long it takes for the material to wear through. The proper and correct result is a mean of six tests; three different directions of the weave, tested twice. Now leather, it is generally accepted, achieves what is known as a ‘slide time’ of between four and four and a half seconds. A heavy-duty, old-school jean, bought on the high street will last perhaps half a second. A modern, lightweight, stretch jean will fall apart instantly, as indeed it would if you came off a bike in a fall. A jean that is a mix of denim and Cordura might achieve a time of around two seconds. In this test, the Rokkertechs scored a slide time of 6.39 seconds. And frankly that’s amazing. We knew they were strong, but until the results came through even Rokker didn’t really appreciate just how impressive they were. 6.39 seconds puts a pair of Rokkers 50% ahead of leather when it comes to abrasion resistance. (And don’t forget, on all its single-layer jeans, Rokker offers a crash guarantee whereby, if you manage to hole them by sliding down the road they’ll give you a replacement pair. Click here for details). And all this in a jean that you could happily work in all day. Indeed here in Guildford in our shop, that’s what we often do. Sean, our shop manager, wears them just about every day. In fact, when he’s not wearing them, it means his mum’s washing them for him! 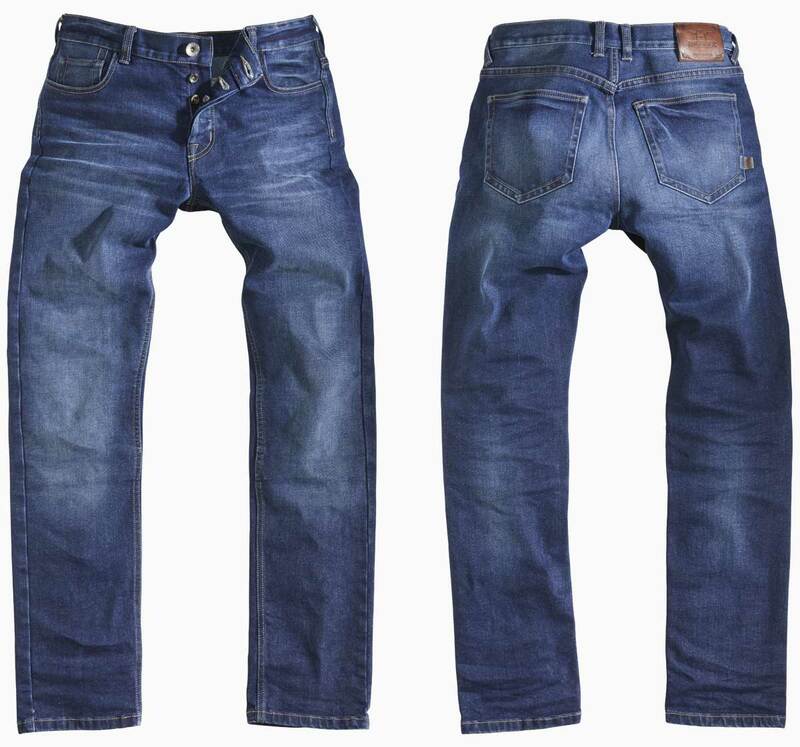 As you can see, the Rokker Rokkertech Straight-Slim looks no different to your average high street jean. From a style point of view, the Rokkertechs are pure street. We are not, we admit, fans of jeans with padded areas, fancy stitching, sewn-in panels, darting lines and so. For us, the perfect biking jean doesn’t look like a bike jean, it just looks like a pair of regular jeans. That’s very much the case with these. Until early 2018, there was just one style of Rokkertech jean. It was known as the Straight-Slim. It was, and is, a slim fit without being skinny. If you’ve spent too much time on the rugby field you might struggle, but they are quite flattering, and they do have a bit of stretch in. They also work well for women, by the way, because they have a medium rise, as opposed to the ridiculously low rise of the ladies’ Revolution jeans. But at the beginning of 2018, Rokkertech introduced a second style to the UK market. It’s called the Straight-Straight. In essence, the upper part of the leg above the knee is the same as the Straight-Slim, but below the knee it is less tapered. It is definitely more relaxed that the Straight-Slim. We reckon the fit is somewhere between a Levi 511 and 501. It’s definitely not what some people call a ‘dad’ fit. It’s slimmer than that. There’s no wash on these jeans. They’re a dark indigo blue. In fact they are a ‘raw’ finish. Now if you’re a denim aficionado, you’ll know what this means. Basically, you’ll have to look after them, and wash them carefully and infrequently. There’s a great article on looking after raw jeans on the Heddels website. If you want to know more, click here. But look after these jeans and, over time, they’ll develop a lovely unique patina that will be yours, and yours alone. The new-for-2018 Rokker Rokkertech Straight-Straight raw jean is exclusive in the UK to Motolegends. 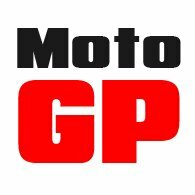 The Straight-Straight jeans are exclusive in the UK to Motolegends, and we suspect that, in the first half of 2018, we will find it difficult getting the stock we need. You may, unfortunately, find yourself on a waiting list, as many people did the first year we introduced the Revolution jeans. Both Rokkertech styles run, in principle, from a 29” waist to a 38” waist. Up to 34”, the sizes increase in one inch increments. Above 34”, it’s two inches at a time. Leg lengths are 32”, 34” and 36”. And the leg length is important, because the armour pocket is fixed, and to get the armour in the right place you need the correct leg length. The correct leg length, by the way, is probably 2” longer than you would wear with a street jean. And that’s because when you sit on the bike, the leg will raise by an inch or two. This does mean that, in many cases, the jeans will look long when you’re walking around in them. But if the armour is in the correct place, we will shorten the leg length for you if you want us to. And we’ll do this for free; it only takes a couple of days. If you buy the jeans to the length you’d normally buy your street jeans, the armour almost certainly will be too high. And that’s no use to anyone. That’s why we go long, and shorten if we have to. It sounds like a bit of a rigmarole, but that’s the way it is. If it’s not too convenient, it’s best to come and see us. Nobody knows these jeans as well as we do. They’re expensive, so it’s nice to get them right. The jeans take D3O armour in the knees and hips. It’s the best armour, and the most comfortable to wear. As it absorbs heat from the body its gets even softer and more pliable so that, after a while, you don’t even know it’s there. Of course, it meets the CE standard, so there’s no trade off whatsoever in terms of safety and protection. So there you have it. 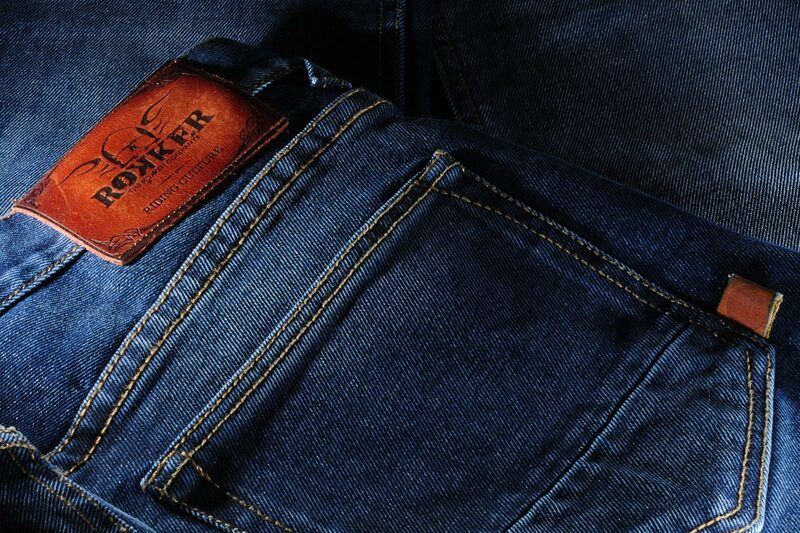 The Rokker Rokkertech jeans. There’s nothing like them. In the summer they’re lovely to ride in as they flow air like a mesh pant, but they deliver abrasion resistance way beyond leather. We have customers who have ridden across India and Africa in them. There’s simply nothing out there that combines breathability and strength like a pair of Rokkertechs. The downside, of course, is that in the winter, and in the cold, they’re going to be chilly. A pair of Merino leggings from somebody like Halvarssons will help, although they’re never going to be at their most impressive in really cold weather. In conclusion, if you want to ride in a denim jean that looks like a high-street jean, and that wears like a high-street jean, but that delivers the abrasion resistance of rhinoceros hide then, frankly, you don’t have many choices. In fact, it’s the Rokker way or no way. At £350 they’re not a cheap jean, but given what they do we reckon they’re well worth the money. You’d easily pay that for a good quality leather trouser, but these are far more practical than leather will ever be. And you can’t compare them with any other riding jean, because honestly there is no riding jean like them.